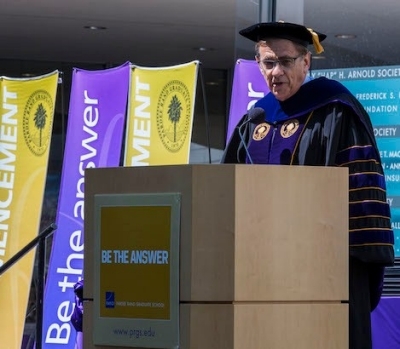 To our graduating fellows; their families and friends; Pardee RAND faculty; the Board of Governors; RAND trustees, staff, and alumni; and other distinguished guests, I join the dean in offering you a warm welcome to RAND’s headquarters campus on this glorious day for this very special occasion. I have a deep affection for the Pardee RAND Graduate School because it has played an important role in my 40-year career at RAND. I’ve taught courses, advised students, and chaired many dissertation and qualifying-exam committees. For a decade, I chaired the admissions committee . . . including the one that admitted musician Arthur Brooks. If you knew the caliber of the people we do not admit, you would appreciate why that experience is equal parts awe-inspiring, and humbling. I came to realize that Pardee RAND is even more than an incredible educational institution. It is more than a preeminent training ground for the next generation of policy leaders. It is one of the RAND Corporation’s most distinctive and vital assets. Students, like the ones we honor here today, bring a rich diversity of experience and infuse RAND’s environment with important new ideas and perspectives. At the same time, by working alongside RAND’s experts on real-world projects—1,000 of them—our students gain insights and practical experience that are simply unmatched among their counterparts at other graduate schools. This synergy can generate new ways of looking at difficult problems, new methods and approaches for dissecting and rebuilding systems and processes, new ways of outlining options and solutions. Because the School operates free of the bureaucratic constraints and organizational rigidity of our public-sector clients at RAND, it has unusual flexibility, freedom, and agility and these can produce a rare spirit of discovery. In short, the RAND/Pardee RAND relationship can help create and then fuel the sparks of innovation that we need to continue our long history of creative problem solving. I have a vision for Pardee RAND in which the School plays an even greater role at RAND . . . serving as a think tank within the think tank . . . a bold place to think big, to swing for the fences. A place to take important risks, in a world where tolerance for experimentation is sadly shrinking. The RAND/Pardee RAND relationship is the key to combining the ingenuity and the nitty-gritty practical experience required to not just conceive solutions to major policy problems, but to see them through to implementation. This is the combination that will help RAND transform the science, art, and practice of policy analysis yet again. The dean and I, along with many others, are working to make that vision a reality. Stand by, because we will need your help, too. Enabling the future . . . To me, that’s always been a thrilling proposition. A daunting one, too. Enabling the future is what RAND has been doing for nearly 70 years. Whether it is identifying the building blocks for the space program, the Internet, and artificial intelligence; devising and shaping policies to make individuals and societies healthier, safer, and more prosperous; or tackling the most dangerous and complex risks to our security, we have been helping policymakers base major decisions on evidence about what works and what doesn’t work. We’ve been enabling the future. Enabling the future is what your time at Pardee RAND has prepared you to do. Your coursework has equipped you with a sensational analytical toolkit and your OJT has given you a chance to apply those tools in the role of trusted adviser. But, your experience here was not really about the tools and techniques you’ve learned. It hasn’t been about the products you helped to create—the memos, articles, books, reports, and presentations. In coming to Pardee RAND and contributing to the work of the RAND Corporation, you have dedicated yourself to using evidence to make a real difference in people’s lives: Using evidence to enable the future. I’m often asked whether RAND-style policy analysis—objective, nonpartisan, based on fact, not conjecture or ideology—what you’ve learned to do as a student at Pardee RAND . . . I’m often asked whether there’s a role for it in today’s world of gridlocked government and hyper-partisan politics. My answer is: More than ever. What else will enable the kind of future we all want and that our children deserve? To our graduates here today, I say thank you, and congratulations on your achievement. It is now my great honor to introduce you to your commencement speaker. When he was only 20 years old, John Lewis had already begun to envision a different future for America, one that benefited from the full participation of all our citizens. As a college student in 1960, he got to work enabling that future. John Lewis organized sit-ins at segregated lunch counters in Nashville. He participated in Freedom Rides to challenge segregation on buses throughout the South. He helped form and then he led the Student Nonviolent Coordinating Committee. In 1965, he was one of the leaders, along with Dr. Martin Luther King, Jr., who spearheaded the march from Selma to Montgomery to demonstrate the need for voting rights. After the marchers were attacked by state troopers on the Edmund Pettus Bridge across the Alabama River, there was a national outcry that led to the passage of the Voting Rights Act of 1965. During these turbulent years, John Lewis was berated and battered, literally. But he and others in the civil rights movement courageously persisted—and changed the course of history, earning the admiration and respect of our nation and the world. John Lewis’ distinguished career has always been one of service and honor. He was director of the Voter Education Project, where he helped to add nearly four million minority citizens to the voter rolls. He was the associate director of ACTION, and then an Atlanta City councilman. In 1986 he was elected to Congress, defeating another legend from the civil rights movement, the late Julian Bond, and he has held that seat ever since. His electoral record is nothing short of remarkable. He has won reelection 14 times, six times without any opposition at all. When he has had an opponent, none has received more than 31 percent of the vote in the general election. In 1998, the opposing party was so desperate that it ran a candidate who was also named John Lewis, hoping I am sure to win by confusion. The electorate was not fooled. This John Lewis defeated that John Lewis with nearly 80% of the vote. John Lewis is an icon . . . of civil rights and of civility . . . consistently achieving transformative social change with dignity and respect for all. Ladies and gentlemen, it is my great privilege to introduce the Honorable John Lewis.